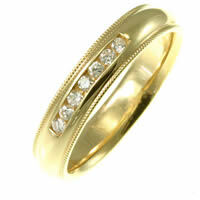 18K Diamond Wedding Band - 18kt Yellow gold diamond, comfort fit, 5.5mm wide wedding band. The ring has approximately 0.50 ct tw diamonds, VS1-2 in clarity and G-H in color. There are 5 princess cut diamonds and each measures 0.10 ct. The ring is matte finish, 5.5mm wide and comfort fit. 14K Diamond Wedding Band - 14kt Yellow gold diamond, comfort fit, 5.5mm wide wedding band. The ring has approximately 0.50 ct tw diamonds, VS1-2 in clarity and G-H in color. There are 5 princess cut diamonds and each measures 0.10 ct. The ring is matte finish, 5.5mm wide and comfort fit. 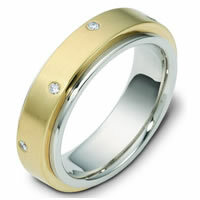 14K Diamond Wedding Band - 14K yellow gold, comfort fit, 4.0 mm wide diamond wedding band. Diamonds total weight is 0.50 ct. The diamonds are graded as VS1-2 in clarity G-H in color. The finish on the ring is polished. Other finishes may be selected or specified. 18K Yellow Gold Diamond Ring. 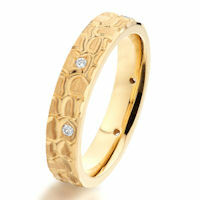 - 18K gold, 5.5 mm wide comfort fit diamond ring, Diamonds total weight is 0.30 ct. Ddiamond are VS1 in clarity G in color. The finish on the ring is brushed. Different finishes may be selected or specified. 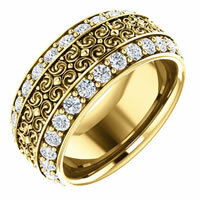 14K Diamond Ring - 14K yellow gold, comfort fit 5.5 mm wide diamond ring. Diamond total weight is 0.30 ct, diamonds are VS1 in clarity G in color. The finish on the ring is brushed. Different finishes may be selected or specified. 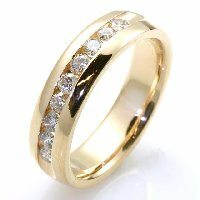 14K Gold Diamond Wedding Band - 14 kt Gold, 8.5 mm wide, 0.15 ct diamond ring. There is one hand crafted rope on each side of the band. The center of the band is a coarse and heavy sandblast finish. The rest of the band is polished. Different finishes may be selected or specified. 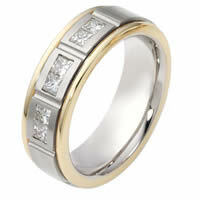 14 K Diamond Wedding Band - 14 Kt Two-tone diamond wedding band, 5.0 mm wide,comfort fit band. The band has one stone that weighs 0.10 ct diamond, VS in clarity and GH in color. The finish on the ring is matte. Other finishes may be selected or specified. 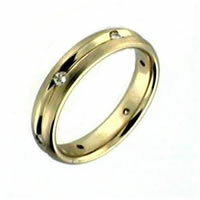 18K Diamond Wedding Band, Rotating Center - 18 K gold center rotating, 9.0 mm wide diamond spinning wedding band. Diamond total weight is 0.40 ct in size six. Diamonds are graded as VS in clarity H in color. The center of the ring is spinning and is a matte finish. The outer edges are polished. Different finishes may be selected or specified. 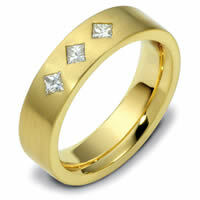 14K Diamond Wedding Band - 14 KT gold 0.40 ct TW Comfort Fit 5.0 mm Wide Diamond Ring. Diamonds are graded as VS in clarity G-H in color. Diamonds are graded as VS in clarity G-H in color. The finish is polished. Different finishes may be selected or specified. 14K Gold Spinning DiamondWedding Band - 14kt Yellow gold spinning diamond, comfort fit, 4.0mm wide wedding band. The ring has 0.05 ct tw diamonds that are VS1-2 in clarity and G-H in color. There are 5 round brilliant cut diamonds, each measures 0.01 ct. The center of the band rotates and has a matte finish. The edges are polished. Different finishes may be selected or specified. 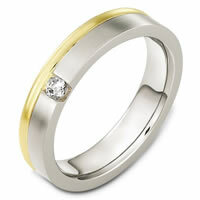 Diamond Wedding Band - 14 Kt Yellow gold and diamond wedding band, 8.0 mm wide, comfort fit band. 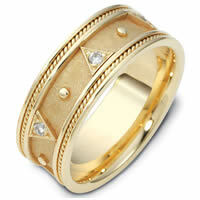 The band is octagonal shape with diamonds on each corner. It holds .35 ct tw diamonds, VS1 in clarity and GH in color. The finish is matte. Different finishes may be selected or specified. 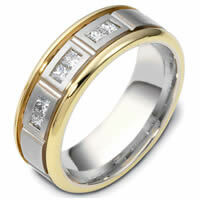 18KT Gold Diamond Wedding Band - 18K 0.30 ct TW princess cut Diamond Band. Diamonds are VS1/G-H. 6.50 mm Wide Comfort Fit Wedding Band. The center of the ring is a matte finish and the outer edges are polished. Different finishes may be selected or specified. 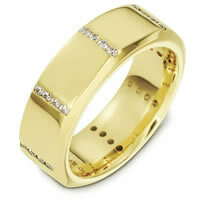 18K Diamond Wedding Band - 18kt yellow gold, 0.25 ct tw, comfort fit, diamond wedding band. Diamonds are VS in clarity G-H in color. The finish is polished. Different finishes may be selected or specified. 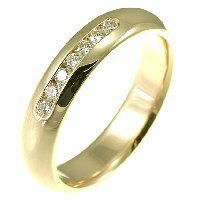 18K Gold Diamond Wedding Band - 18K Gold 8.5 mm wide, comfort fit, 0.15 ct diamond ring. Diamonds are graded as VS in clarity G-H in color. There is one hand crafted rope on each side of the band. The center of the band is a coarse and heavy sandblast finish. The rest of the band is polished. Different finishes may be selected or specified. 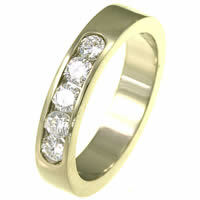 Diamond Wedding Band - 18 Kt Two-tone diamond wedding band, 5.0 mm wide, comfort fit band. The band has one stone that weighs 0.10 ct diamond, VS in clarity and GH in color. The finish on the ring is matte. Other finishes may be selected or specified. 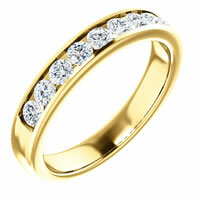 18K Diamond Wedding Band - 18 KT Gold 0.40 ct TW Comfort Fit 5.0 mm Wide Diamond Ring. Diamonds are graded as VS in clarity G-H in color. The finish is polished. Different finishes may be selected or specified. 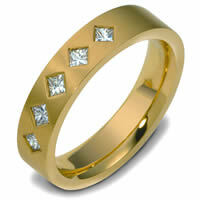 18K Diamond Wedding Band - 18kt yellow gold, 5.0 mm wide, comfort fit diamond wedding band. Diamonds total weight is 0.25 ct and are graded as VS in clarity G-H in color. The finish is polished. Different finishes may be selected or specified. 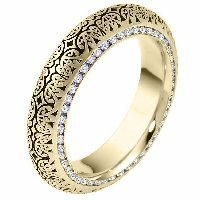 18K Gold Spinning DiamondWedding Band - 18kt Yellow gold spinning diamond, comfort fit, 4.0mm wide wedding band. The ring has 0.05 ct tw diamonds that are VS1-2 in clarity and G-H in color. There are 5 round brilliant cut diamonds, each measures 0.01 ct. The center of the band rotates and has a matte finish. The edges are polished. Different finishes may be selected or specified. 18K Diamond Wedding Band - 18K yellow gold, comfort fit, 4.0 mm wide diamond wedding band. Diamonds total weight is 0.50 ct. The diamonds are graded as VS1-2 in clarity G-H in color. The finish on the ring is polished. Other finishes may be selected or specified. 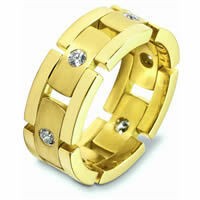 14K Diamond Wedding Band, Rotating Center - 14 K gold center rotating, 9.0 mm wide diamond spinning wedding band. Diamond total weight is 0.40 ct in size six. Diamonds are graded as VS in clarity H in color. The center of the ring is spinning and is a matte finish. The outer edges are polished. Different finishes may be selected or specified. 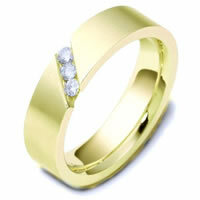 Diamond Wedding Band 18K Gold - 18Kt Yellow gold and diamond wedding band, 8.0 mm wide, comfort fit band. 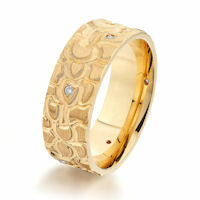 The band is octagonal shape with diamonds set on each corner. It holds 0.35 ct tw diamonds, VS1 in clarity and GH in color. The finish is matte. Different finishes may be selected or specified. 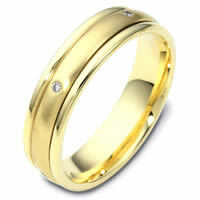 18K Gold Diamond Wedding Band - 18K yellow gold comfort fit, 6.0 mm wide, diamond ring. Diamond weighs 0.15 ct tw and graded as VS1 in Clarity G in Color. The finish on the ring is brushed. Different finishes may be selected or specified. 14K Gold Diamond Eternity Ring - 14K yellow gold, comfort fit, 6.0 mm wide, eternity band. Each diamond is 3.0 mm in diameter and diamond total weight is approximately 2.40 ct. Diamond total weight is estimated for a size 6.0 ring. The diamonds are graded as VS1 in Clarity G in Color. The whole ring is polished. Different finishes may be selected or specified. 14K Diamond Wedding Band - Diamond wedding band. 14k yellow gold 6.0mm wide 9 round brilliant cut channel set diamonds with total weight 0.54ct. The diamonds are graded as VS in clarity G-H in color. The ring is comfort fit and high polish. 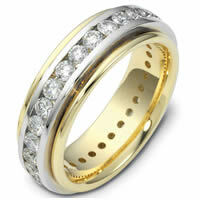 18K Spinning Diamond Wedding Band - 18kt Yellow gold diamond spinning, eternity, comfort fit, 6.5mm wide wedding band. The ring has 0.50 ct tw diamonds that are VS1-2 in clarity and G-H in color. There are 25 round brilliant cut diamonds, each measures 0.02 ct. The center portion of the ring has a matte finish and the edges are polished. Different finishes may be selected or specified. 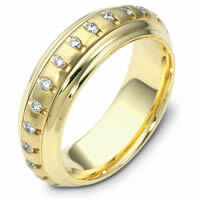 14K Spinning Diamond Wedding Band - 14kt Yellow gold diamond spinning, eternity, comfort fit, 6.5mm wide wedding band. The ring has 0.50 ct tw diamonds that are VS1-2 in clarity and G-H in color. There are 25 round brilliant cut diamonds, each measures 0.02 ct. The center portion of the ring has a matte finish and the edges are polished. Different finishes may be selected or specified.